It’s getting to that muggy, sunny part of the year where the days are long and all I want to do is lie outside in the sun and consume ice cream, strawberries and salads. <– I’ve actually been doing all of this since May when I was revising for my exams, as proven by my impressive tan lines underneath my rings. For me, salad wasn’t always a delicious way to consume vegetables as I grew up eating sad shredded iceberg, WITH NO DRESSING, at school. I’m not a rabbit. 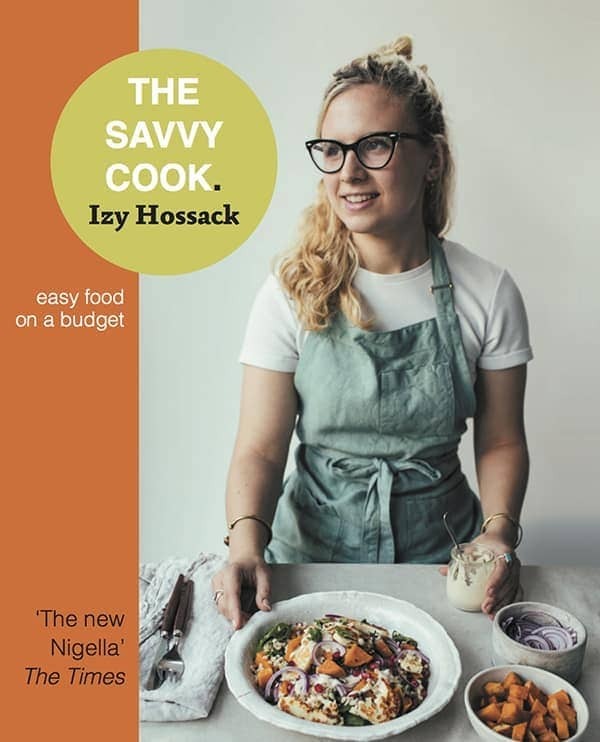 It ruined my opinion of salads for years until I eventually started eating them at home and realised that really salads are delicious bowls of toppings padded out with crispy leaves and brought together by a zippy vinaigrette. I can get into salad ruts – tomato, red onion, spinach, mustard dressing is my standard – but one of my favourite things to do when this happens is go for salady ‘tacos’ like this. 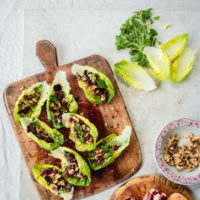 Using gem/romaine lettuce, chicory, endive or even rice paper wrappers you can scoop up a bunch of fillings straight into your gob. The outer casing just holds it all together for you! My main bugbear between me and these salads used to be the leaf washing. My dad often grows lettuce, spinach and kale at his allotment and this stuff is real muddy. It requires an even more thorough cleaning and tbh I’m just a lazy person. I’ve been using the OXO salad spinner for my leaves (and herbs! and berries!) this summer and not only is it easy to use, it’s also so satisfying (see the GIF below of it in action). This, paired with their salad dressing mixer which a) includes measurements on the side for easy measuring straight into the jar and b) doesn’t leak, (unlike many jam jars I’ve used in the past), makes for super streamlined salad making. These salad cups are a play on one of my favourite Japanese dishes ‘nasu dengaku’ which is a baked aubergine, brushed with miso glaze. Here I’ve cubed and roasted aubergine then layered that up in gem lettuce leaves with walnuts, pomegranate seeds, basil and a miso-ginger dressing. It’s my ideal kind of salad (i.e. mostly toppings & dressing) and is a bit more interesting than your standard bowl of chopped leaves. Hope you enjoy the recipe, let me know if you try it out! Preheat the oven to 180oC (350oF). Cut the aubergines into 2cm cubes, toss with the olive oil on a baking tray and roast for 30 minutes until browned and shrunken. Set aside. Rinse the lettuce leaves and basil leaves then spin dry (I used the OXO salad spinner). Arrange the lettuce leaves on a serving plate or large chopping board. Tear the basil into small shreds. 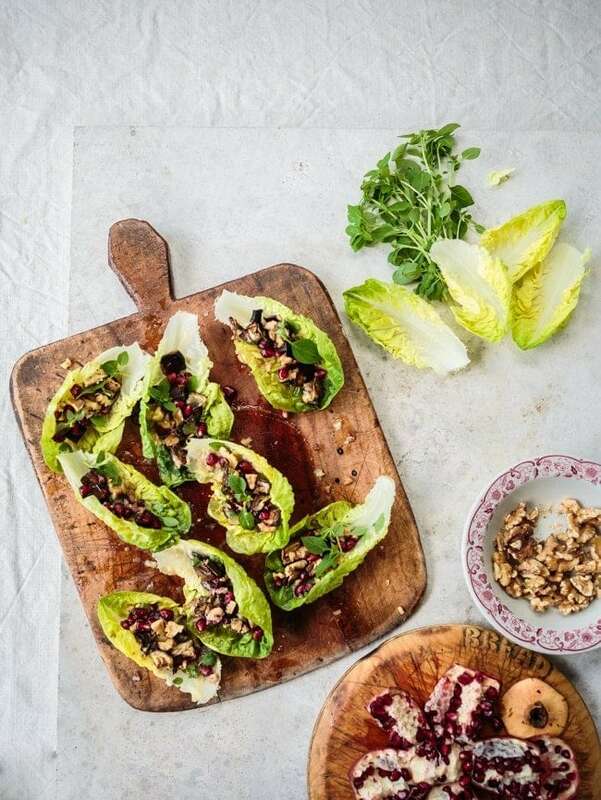 Fill the lettuce cups with cubes of roasted aubergine, then pomegranate seeds, chopped walnuts and torn basil. Combine all the dressing ingredients in the OXO salad dressing mixer and twist the green band until the mixture is emulsified. Pour the dressing over the filled lettuce cups and serve immediately. Quite interesting Izy. Looks like a delicious combination. Oh yeah washing salad leaves are a pain. Now I buy them washed when available, especially Spinach. Noticed you used finely grated ginger. Did you freeze the ginger and then grate it, because it is much easier that way. Did not know OXO offered a salad spinner. Good company and high quality products. i have a few of their products and they have lasted. These look and sound amazing I’m on a healthy eating mission so always looking for new ideas. I didn’t see the salad dressing jar, do you have nfo on it where to get the bamboo ginger grater??? I’m holding it in the collage of images where I’m pouring in the rice vinegar 🙂 The bamboo ginger grater is my mum’s from many years ago but I bought a really similar one on amazon about 3 years ago so I’d look there first! Wow. 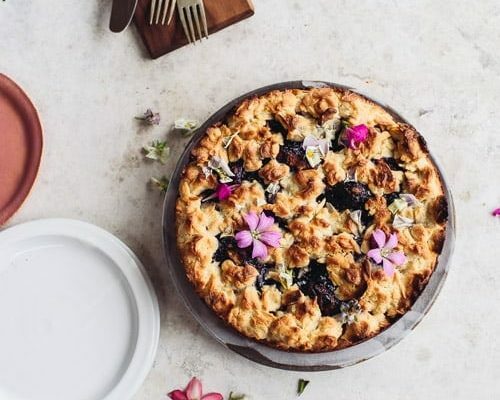 This is probably the most summerlike recipe I have seen this year so far. It looks both refreshing and tasty.